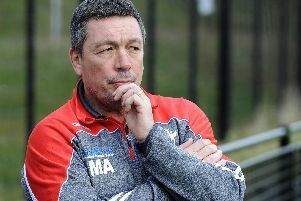 Sheffield Eagles director of rugby Mark Aston says he could have up to six players back as his side go in search of their first win of the campaign at Barrow, on Sunday. A depleted Eagles were knocked out of the Challenge Cup by the Raiders last Sunday, but Aston returns to Cumbria in a stronger position after confirming he will be backed by three players on dual-registration from St Helens, whilst Castleford loan pair Garry Lo (pic) and Cory Aston also return to the fold. “The important thing is that we have a few players back available” Aston said. “We are looking at maybe having six players that we didn’t have last week. We need the extra bodies because we fell short up there. Aston may yet have a further boost with the long running saga behind Menzie Yere’s visa approaching a conclusion, with the Eagles chief optimistic of also having the veteran centre on Sunday. The PNG powerhouse has missed the first six games of the campaign as the club wait for confirmation from the Home Office over eligibility. “Fingers crossed we mhave Menzie” Aston added. “That will be quite good for us. We moved on a stage with that, but we still need it rubber stamping. It is a letter we are waiting on from the Home Office. It appears to have gone through the system now, it’s just waiting to be signed off. New signing Corey Makelim is also awaiting formalities over his registration, but Aston believes the USA international will be given the green light for the Bank Holiday double-header against Rochdale and Batley.